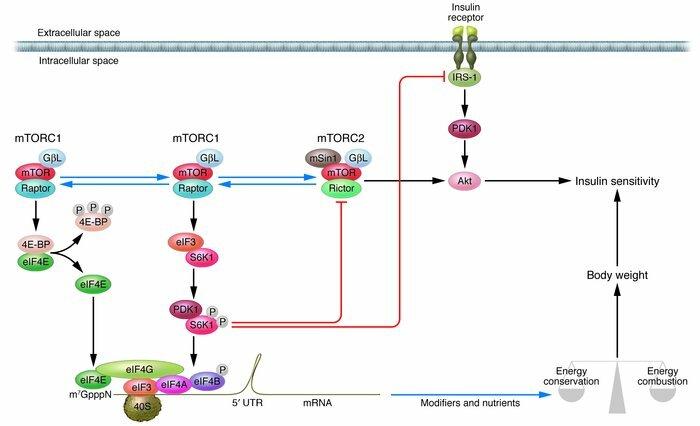 A model of the regulation of body weight and insulin sensitivity by mTOR, S6K1, and 4E-BP. Nutrients and hormones stimulate the association of mTORC1 with eIF3. mTORC1 phosphorylates eIF3-associated S6K1 at Thr389. Phosphorylated S6K1 is dissociated from eIF3 and subsequently phosphorylated and activated by PDK1. S6K1 phosphorylates eIF4B, increasing the ability of eIF4B to enhance eIF4A helicase activity. S6K1 phosphorylates IRS-1, inhibiting insulin signaling. S6K1 phosphorylates mTOR, which may decrease the abundance of mTORC2 and/or the ability of mTORC2 to phosphorylate Akt at Ser473, contributing to insulin resistance. A separate pool of mTORC1 may phosphorylate 4E-BP at multiple sites, resulting in dissociation of eIF4E from 4E-BP. 4E-BP–free eIF4E binds to eIF4G that is associated with both eIF4A and eIF3. eIF3 binds to the 40S ribosomal subunit and recruits the 40S subunit to the 5′ cap. eIF4A, assisted by eIF4B, unwinds the secondary structure in the mRNA 5′ UTR, facilitating the assembly of a translation initiation complex. The data reported in this issue by Le Bacquer et al. (1) suggest that reduced expression of 4E-BP increases the pool of mTORC1 that phosphorylates and activates S6K1. These data also raise the possibility that genetic modifiers and nutrients may modify the ability of 4E-BPs to repress the translation of key regulators of energy conservation and combustion programs, thereby regulating adiposity and body weight, which indirectly modulate insulin sensitivity. GβL, G protein β subunit–like protein; m7GpppN, the 5′ cap structure; mSin1, mammalian stress-activated protein kinase interacting protein 1; Raptor, regulator-associated protein of mTOR; Rictor, rapamycin-insensitive companion of mTOR.